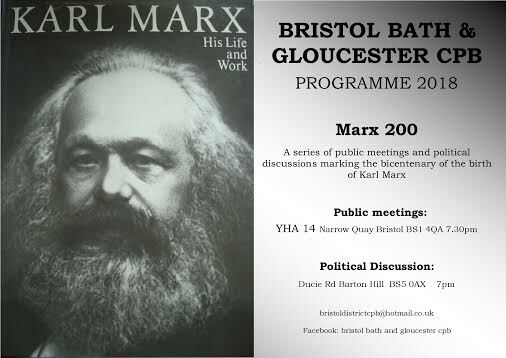 Bristol Bath & Gloucester CPB branch has drawn up a calendar of public meetings, political discussions and social events for the year ahead. The theme, on this the 200th anniversary of his birth, is the life and work of Karl Marx. If you are interested in his works and their continuing relevance I hope you will join in and contribute to our shared learning. Details below of forthcoming events. We Are The Lions Mr Manager. Friday April 6th St Michael’s Church Hall, Bishopston. Bristol BS7 8NT. Presented bythe local Morning Star Readers and Supporters Group this new production by Neil Gore marks the 40th anniversary of the Grunwick Strike 1976- 78. It is based on the experiences of Jayaben Desai and members of the Grunwick Strike Committee and their long battle against the management and establishment forces to gain Union recognition. She turned the dispute into a national movement for human rights and dignity inspiring future generations. South West workers have lost out more than most. Due to the violence shown by far right thugs in the UK here is a link to Unite Against Fascism.